A new report from Congressional Quarterly indicates that Congress will soon announce another backroom budget deal that would bust the spending caps set by the Budget Control Act. 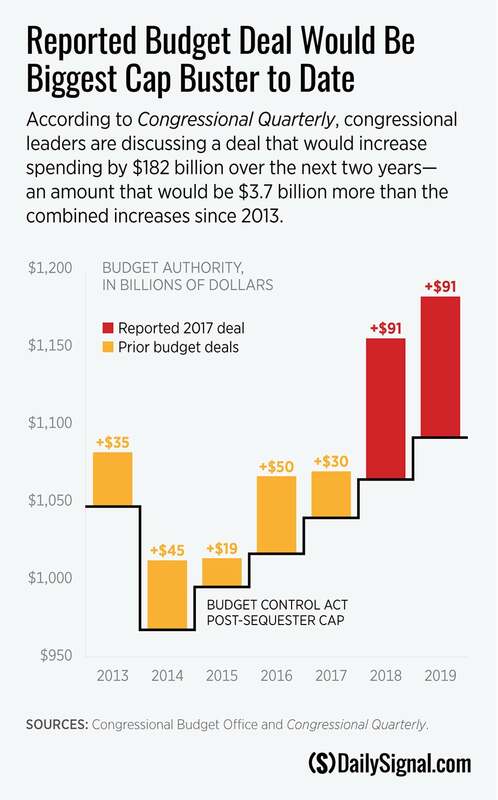 According to the report, the deal would break the discretionary spending caps by at least $182 billion over the next two years. If true, this would bust the budget caps by more than the previous three budget busting deals combined. This is no way to govern. The budget and appropriations process should take place in the light of day through regular order, which allows for transparency and forces members of Congress to perform their essential oversight function. To throw salt on an open wound, it appears that lawmakers are considering not offsetting some of the spending increase—and possibly all of it. This would be a huge departure from previous budget cap busting deals forged during the Obama administration, and would blow a huge hole in the deficit with higher spending. Doing this would be both reckless and irresponsible. Congress should follow the law and honor its 2011 commitment to control spending by prioritizing items within the budget authorized under the Budget Control Act. The caps were put into place as a check on Washington’s spending addiction, and remain one of the few tools available to provide fiscal restraint. There is a legitimate need to prioritize national defense spending. America’s troops have faced years of underfunding under the disproportionate burden imposed by the Budget Control Act’s arbitrary defense and non-defense category caps. Congress could solve this problem by amending the Act to remove the defense/non-defense firewall and leave in place one overall discretionary cap. This would give lawmakers the flexibility to provide additional defense funding without more deficit spending. There are numerous outdated, inefficient, and improper domestic programs that could be cut or eliminated to allow for adequate defense spending. The Heritage Foundation’s “Blueprint for Balance” identified $87 billion in savings that could be realized in 2018 alone. If Congress decides to provide additional discretionary spending above the total cap, then it should only do so if those increases are fully and legitimately offset by other spending reforms, including any interest on the debt incurred as a direct result of the cap-busting budget deal. The past two budget deals were wrought with gimmicks, but on paper they provided offsets to increases in discretionary spending and achieved small, but real, reforms to mandatory spending. Republicans in Congress have repeatedly run on and championed the importance of fiscal responsibility, and of getting the nation’s $20 trillion-plus debt under control. Unfortunately, when the time has come to put words into action, too many lawmakers have fallen short. Now is their chance to stand up for fiscal responsibility by holding true to the goals of the Budget Control Act and reducing the size of government.